Greased Lightning was an especially busy boy this week, but with the addition of a few Tot-friendly school activities, his energy was pointed in the right direction! He was encouraged to do a little color sorting using a container of primary-colored Legos. I put out four doll-sized plates (You could also use cups, plastic food containers, or even just squares of construction paper.) and instructed him to sort the Legos according to color. When his attention span was at its limit with sorting, he used the un-sorted ones to create a Lego masterpiece. Which was just fine by me, because he was constructively occupied at my side during two complete math lessons. The hubs brought home this giant box this week...and as an added bonus, a new dishwasher came with it! After shoring up the sides with some more cardboard and cutting a door and window, he welcomed the kids into their temporary fort. In addition, it made a very quiet reading nook and was even the backdrop for a few impromptu skits. Greased Lightning got the most use out of it as he was able to have some alone time (a welcomed rarity around these parts) with some favorite toys while the others were at the school table. As simple of an idea as it may seem, puzzles are often a forgotten "fun." Since Sweetie Pea was a tot, I have been picking board puzzles up at garage sales and thrift shops. I now have an entire drawer in one of my school cupboards/hutches filled with dozens of quality puzzles. The drawer is at tot-level and "open" to the public... meaning Greased Lightning and big brother Blonde Warrior...whenever they need some table time. Here are a few more tot-friendly ideas. Found your blog via Hip Homeshcool Hop. Love the activities you have posted and we will definitely be back. We also have a toddler boy so we know just how much fun and excitement you must have! Great job! 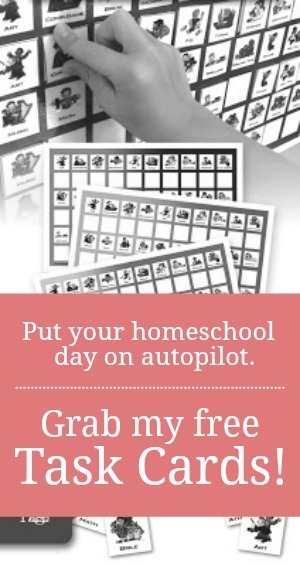 Feel free to visit http://HomeschoolPool.info too! these are great activities for little ones :) here from the HHH as well, happy week to you all! I am always in search of great puzzles as well and prefer the wooden ones over cardboard. We are currently doing less structured homeschooling because my printer has pooped out so we are a bit more hands on type activities right now, thanks for the ideas.